Jason is the Southeast Iowa News Correspondent. He established Tri States Public Radio's news bureau in Keokuk in September 2003. The bureau has moved from his apartment to the Hotel Iowa before landing in its current location at the Daily Gate City newspaper at 1016 Main. Jason provides short- and long-form news coverage from southeast Iowa, northeast Missouri, and portions of west-central Illinois. Jason covers multiple governmental boards including the Keokuk City Council, the Lee County Board of Supervisors and the Burlington School Board. Jason was born in Burlington, IA and grew up in neighboring Henderson County before graduating from Monmouth High School. He graduated from WIU in 2002 with Bachelor’s Degrees in Communications and History. While in Macomb, he was a member of the WIU Track & Field team, serving as Captain during his senior year. Jason received his Master’s Degree in Public Affairs Reporting from the University of Illinois-Springfield in 2003. He and his wife Jamie, a middle school teacher, have called Quincy home since 2007. They have two dogs (Howie and Sadie), one nephew and several god-children. 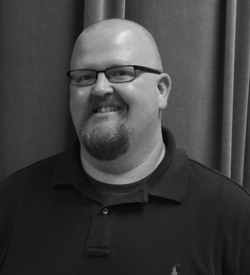 During Jason’s free time, he enjoys watching sports, spending time with friends, playing fantasy football and traveling to the Lake of the Ozarks with his wife.